Cecilia Barron feels for one of the two bumps on her scalp. “Here it is,” she says, gently touching a spot on the top of her head. It’s invisible, unless Barron parts her hair to reveal the little nodule, a lump of flesh no bigger than a pea. In an hour, a nurse will come into the room, feel for the bumps, and slide a needle into each one, plunging millions of cells into Barron’s head. The upcoming procedure is making 46-year-old Barron a little nervous as she and her son wait in a room at the City of Hope cancer research center and hospital outside of Los Angeles. She gets a numbing cream on her scalp and starts to relax, cracking jokes with one of the nurses about 1990s hairdos and makeup. Barron lives in LA with her husband and kids and is a cake decorator at Costco. She’s been dealing with brain tumors since 2007, and has undergone chemotherapy, radiation, and multiple surgeries. Cancer has been such a constant part of her life over the last decade that she named it. “Junior’s tripping again,” she says each time bad news recurs. Anything, at the end of the day, I’m willing to do. The only thing that freaks me out is the needle. Last summer, Barron’s cancer went from stage 2 to stage 3 oligodendroglioma. Behnam Badie, her surgeon at City of Hope, told her that she qualified for an experimental treatment in which her own T cells would be engineered to recognize an antigen on the surface of her tumor cells, then would be injected into her brain. 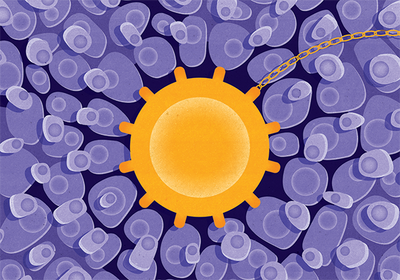 Therapies containing such chimeric antigen receptor (CAR) T cells have already been approved for some types of so-called liquid cancers of the blood and bone marrow—large B-cell lymphoma and B-cell acute lymphoblastic leukemia—but the approach has not had as much success for solid tumors like Barron’s. 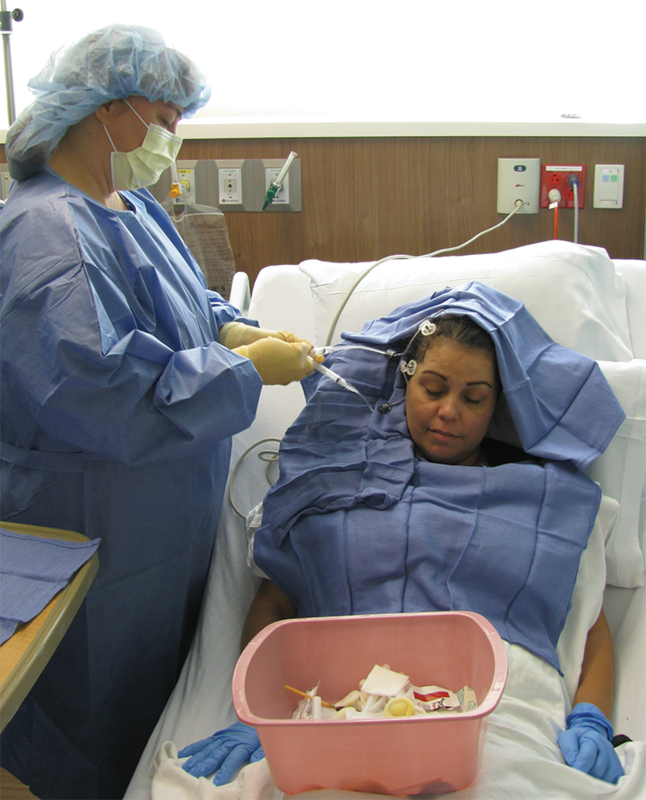 A DOSE OF CELLS: Brain cancer patient Cecilia Barron receives an injection of her engineered T cells. Barron sits up on the hospital bed as a pair of nurses comes in with the vial of T cells. The bumps into which they are injected are catheters, one tapping into the cavity of her brain where Junior had been excised a month earlier, and the other into the cerebral spinal fluid of a ventricle. It takes a few minutes to inject the cells, then it’s time to wait. It will be several hours before Barron can go home, and then weeks, months, and hopefully longer to see if her cancer keeps quiet. Five months after the CAR T treatment in September 2018, Barron is feeling well, and her MRIs and PET scans show no signs of Junior’s return. Positive signs like these have Badie and others optimistic that CAR T technology will be effective at killing solid tumors, as it has been for certain liquid cancers. There are a now a number of clinical trials in early stages pursuing the therapy for pancreatic cancer, mesothelioma, lung cancer, breast cancer, and others. These tumors present challenges, however, that blood and bone marrow cancers don’t. For starters, solid cancers are notoriously hostile environments: acidic, hypoxic, and immunosuppressive. This makes it difficult for the T cells to infiltrate and persist in the solid cancerous mass. The heterogeneity of tumors also means that the chosen CAR won’t bind to every tumor cell. Barron is one of dozens of brain cancer patients treated with CAR Ts at City of Hope over the past several years. Many of these patients who suffer from glioblastoma (a.k.a. Grade 4 astrocytoma), the most advanced form of the disease, have exhausted all other options and face a grim prognosis. The clinical program remains in Phase 1, but the therapy has evolved over the years in both the CAR design and the delivery of the treatment. Serious research into the therapy for brain cancer started almost 20 years ago after cancer biologist Waldemar Debinski, then at Penn State, discovered that the receptor for the immune signaling molecule interleukin 13 (IL-13) was present on glioblastomas, but not on normal brain tissue.1 The receptor thus seemed like a good target to home in on cancer cells while sparing healthy ones. In May 2004, the City of Hope team injected CAR T cells directly into the brain of the first of three patients with glioblastoma. The researchers observed no major untoward effects during the weeks when the patients received the infusions, an important achievement considering that one of the biggest drawbacks to approved CAR T therapies is the potential for serious immune overreactions. At the same time, there were flickers of responses in the patients’ cancers, such as signs of tumor death and a reduction in IL-13 abundance. But no one was cured; all three patients died within a year of receiving treatment.2 “That led us back to the bench” to optimize the CAR itself before launching a larger trial, says Christine Brown, who leads the brain tumor CAR T research at City of Hope. In 2015, City of Hope began a new CAR T trial for glioblastoma using the modified cells. The first patient to receive a full course of treatment was a pediatric surgeon named Rich Grady. “It still gives me chills,” Brown says, recounting Grady’s case. Like other patients with this disease, his cancer had recurred following chemo, radiation, and surgery, and by the time he enrolled in the trial, he was expected to live only a few more weeks or months. As Grady’s T cells were being prepared, the cancer showed up in new spots. Time was running out. Once a week for six weeks, Grady received injections of his engineered T cells into the area of his brain where his primary tumor had been surgically removed. A follow-up MRI scan revealed that, while the primary tumor did not grow, cancer had appeared in new locations in his brain, as well as in his spine. Badie’s team decided to try infusing the cells into the cerebrospinal fluid, in the hope that they would disperse and track down these tumors elsewhere in the body. Badie says he’ll never forget the moment he pulled up the next MRI scan after Grady had received several intra-ventricle infusions. The tumors, including the primary tumor and the new lesions, had all shrunk.3 After the full course of 10 infusions, none of the tumors were detectable. “It was unbelievable,” says Badie. He’d expected that he would be giving Grady the same bad news he gave most of his glioblastoma patients—that the cancer was winning and that he had only months left with his family. But the CAR T-cell therapy appeared to have destroyed an indefatigable cancer. What’s more, says Brown, Grady’s cancer cells didn’t all display the IL-13 receptor that the CAR targeted—suggesting that the engineered T cells had helped recruit Grady’s immune system to fight the cancer. “What we believe is that the CAR T cells acted as a spark that ignited an endogenous immune response.” Unfortunately, she adds, “it still wasn’t enough, because the damn tumors came back.” Grady passed away April 25, 2017. Although Grady didn’t survive the recurrence of his tumors, his positive response during the trial showed that it was possible to kill off glioblastoma using CAR Ts, and it allowed the City of Hope researchers to establish the dual-catheter protocol in which Barron and other patients have injections both at the site of the tumor and in a ventricle. 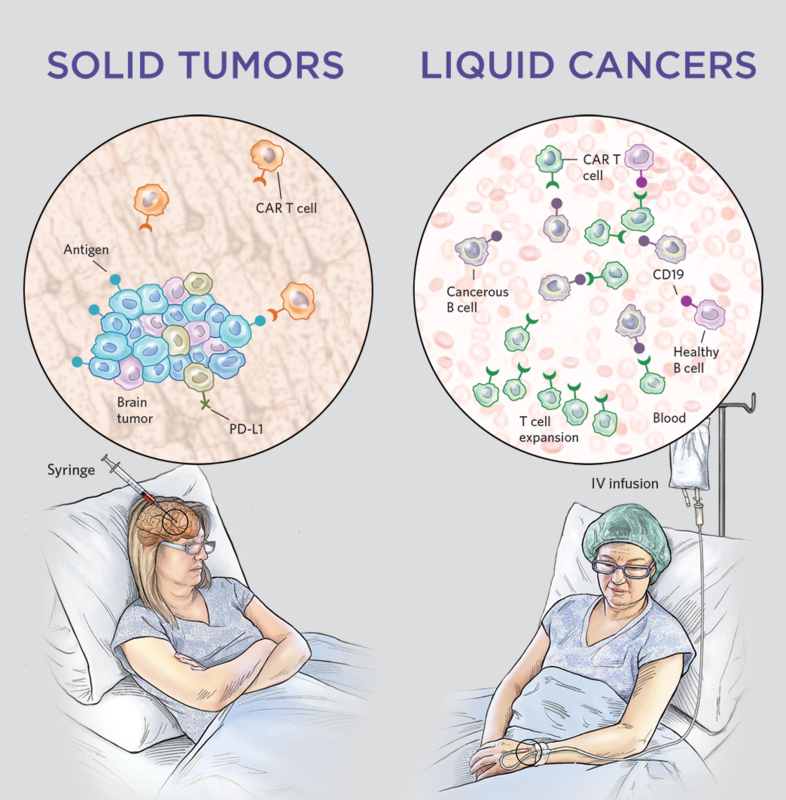 CAR T delivery is a complicating factor in the treatment of solid tumors.With liquid cancers, cells are administered by a blood infusion, and once in circulation, the CAR Ts can seek out and destroy the rogue cells. For solid tumors, it’s not so simple. “CAR T therapy does require a cell-to-cell interaction, and those are more likely to happen with circulating tumor cells than a solid mass,” says Manuel Litchman, the president and CEO of Mustang Bio, a biotech that is sponsoring some of City of Hope’s CAR T trials on brain cancer and is also developing its own CAR T-cell therapies for lymphoma. What we believe is that the CAR T cells acted as a spark that ignited an endogenous immune response. In a follow-up study, Ahmed and his colleagues are now trying to see if they can get more CAR T cells to the tumor site by helping the cells stick around longer in the body. They had previously observed that the CAR Ts disappear within a few weeks to months, but some data indicate that repeated infusions can keep the cells in the body longer and may thereby help keep recurrence at bay. An alternative approach is to encourage the cells to proliferate once they’re injected. This time around, Ahmed and his colleagues will first administer a chemotherapy that destroys the patients’ lymphocytes, hoping to encourage the CAR T cells to expand and fill in that immunological vacuum. 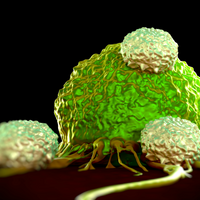 Still, getting enough of the engineered T cells to the site of solid tumors remains a challenge, says Steven Albelda, a CAR T developer at the Perelman School of Medicine at the University of Pennsylvania. “In animal models, if you inject them intravenously, the number of cells that get into the tumor is very, very small.” This has led his group and others to move toward administering the cells locally, as with the intervention given to Grady and Barron. Albelda’s group is starting a trial in which patients will receive the cells in the pleura surrounding the lungs to treat cancers growing there. 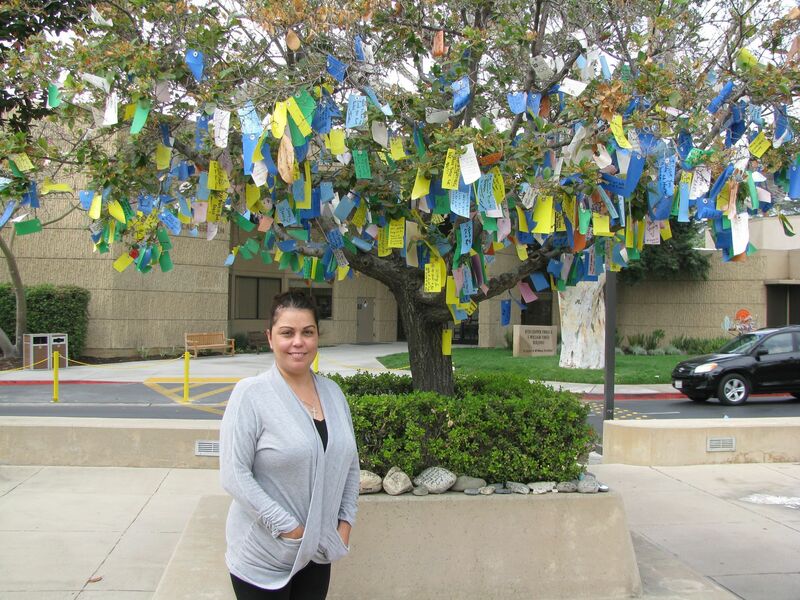 Cecilia Barron, who has been fighting brain cancer for more than a decade, stands outside the City of Hope cancer research center and hospital, where she received injections of CAR T cells directly into the site where her tumor was excised. Prasad Adusumilli at Memorial Sloan Kettering Cancer Center was the first to infuse patients with CAR Ts intrapleurally to treat cancers in the region. He and his collaborators had found that delivering the T cells locally was much more effective at ridding mice of tumors than delivering them intravenously, and that the cells stuck around for much longer.5 Those results led the team to start a clinical trial for people with lung cancer, mesothelioma (cancer of the lung’s lining), or breast cancer that has spread to the pleura and is positive for the protein mesothelin, which the CAR Ts are designed to recognize. The problem is twofold. For one, solid cancers are heterogeneous. Unlike the cancerous B cells that the approved CAR Ts target, which pretty much across the board make CD19, not all solid tumor cells necessarily carry the antigen that the CAR T is designed to attack. Secondly, even if a single-target CAR T is successful in eradicating tumors, cancers can sometimes return after having shed that antigen. Such was the case with Rich Grady. Brown at City of Hope says that when Grady’s tumors came back more than seven months after he had started CAR T infusions, they didn’t have a lot of the targeted antigen. It might therefore be necessary to target more than one antigen when deploying CAR Ts, says Brown—by putting multiple CAR types on the same T cell or by engineering complementary sets of CAR Ts. There will be many more forms of sophisticated T cells than we use these days and that will enable this. We’re in the very early days. The selection of the antigen target is critical for CAR Ts to work. To avoid dangerous side effects, developers must build a CAR T that selectively hits cancer cells while sparing healthy tissue. This has been a challenge for CAR T therapies to treat blood malignancies, because normal B cells also carry the CD19 antigen. As a result, the interventions can lead to a drop in immunoglobulin production that puts patients at risk of serious infections. When it comes to solid tumors, researchers have the opportunity to select truly cancer-specific targets, so-called neoantigens. t the University of Pennsylvania, for example, immunologist and oncologist Carl June’s team is developing a CAR that targets epidermal growth factor receptor (EGFR) on glioblastoma cells. 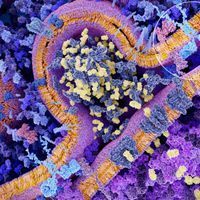 Specifically, he and his colleagues have designed the receptor to bind a splice variant that is found nowhere else in the body, he says. Even if researchers can’t find an antigen that is exclusive to cancer cells, they may be able to identify a target that is much more abundant in tumors than in healthy tissue. At U Penn, Albelda and his team are targeting mesothelin, which is overproduced by a variety of cancers, including mesothelioma, pancreas, ovarian, and some lung cancers. In two early stage trials, the treatment has avoided off-target toxicity in patients with these cancers. One combination that has already emerged in clinical testing is a CAR T alongside another immunotherapy called a checkpoint inhibitor. 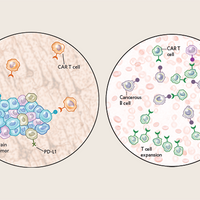 Not only do CAR T cells face barriers to entry, survival, and expansion, they are also challenged with so-called immune checkpoints—immune-disrupting pathways that can be upregulated in cancer. There are approved checkpoint inhibitor drugs, such as monoclonal antibodies that target various checkpoint proteins on endogenous T cells, that stamp out such signals, and researchers are now beginning to pair these with CAR T therapies for solid tumors. In Adusumilli’s trial of people with mesothelin-positive cancers at Memorial Sloan Kettering Cancer Center, the most dramatic recoveries were experienced by about a half dozen patients who received a checkpoint inhibitor following regional delivery of CAR T cells. Patients who got both treatments no longer need other cancer treatment and have even gone back to work. In this same trial, the doctors plan to give additional patients a CAR T infusion intrapleurally followed by a checkpoint inhibitor three weeks later. Likewise, investigators at the University of Pennsylvania are launching a clinical trial using CAR Ts that target an EGFR variant on glioblastoma in combination with a checkpoint inhibitor. 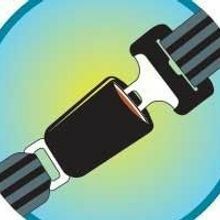 Scientists are also developing methods to have the CAR Ts themselves bring along anti-checkpoint tactics. In 2016, Adusumilli and his colleagues engineered CAR T cells that produced a genetically modified checkpoint receptor that acted as a decoy to prevent effective checkpoint signaling, for example.7 Beginning in 2020, his team hopes to begin administering CAR Ts with a built-in checkpoint inhibitor system. Checkpoint-inhibiting CAR Ts are an example of “armored CARs,” which can be engineered to produce any manner of assistants. For instance, CAR T cells that release proinflammatory cytokines help to ramp up the activity of other types of immune cells. In 2017, a group at Memorial Sloan Kettering treated mice that had murine ovarian cancer by infusing them with CAR Ts producing the cytokine IL-12,8 while June’s group found success in mice with melanoma using a CAR T that secreted the cytokine IL-18.9 “We’re going to see many different variations on that theme to make cells that are resistant to the tumor microenvironment,” says June. W. Debinski et al., “Receptor for interleukin 13 is a marker and therapeutic target for human high-grade gliomas,” Clin Cancer Res, 5:985–90, 1999.